Found a good list of prototyping tools on cooper.com. A lot of folks get confused over the differences between Git and GitHub and use the words interchangeably. Also when folks talk about GitHub, it is assumed that it is only available on the public cloud and cannot be hosted in-premise. Git is essentially a distributed version control system. It is called 'distributed' because we can use it locally and disconnected from the internet and then push our changes to another centralized repository (such as GitHub, Team Foundation Server, CodePlex, etc.) as and when required. For a good comparison of centralized vs distributed source control systems, please read this blog post. GitHub is a hosted service (public cloud) that can host your repositories and allows you to access your repositories via a web based interface. It is possible to use Git without GitHub, but only on a local machine. Hence in order to collaborate and work in a team, we have to use GitHub. In the free plans of GitHub, we can create any number of public repositories, with unlimited collaborators. In the paid plans of GitHub, you can create private repositories. GitHub Enterprise is the on-premises version of GitHub, which you can deploy and manage in your own, secure environment (private cloud). When we create compelling user experiences for our customers, we follow a similar process. Gain a deeper understanding of the customer and the industry segment the customer operates in. Who are their end-customers? What is the market positioning of their product? Based on customer segmentation, create personas and user journey maps. Create a high level information architecture. Create low fidelity prototypes (mockups) using Visio, PowerPoint, etc. After review, create high fidelity dynamic prototypes using tools such as iRise, Axure, etc. Work with Visual/Graphic Designers during this phase. Once the application is developed, do a usability test using tools such as TechSmith Morae. Create a feedback loop for UX changes that gets incorporated in the next agile release. Make sure that your UX team and Web/Mobile Analytics teams are working in tandem to resolve all UX concerns and improve the customer experience. Over the past decade, the simple Markdown text formatting syntax has gained a lot of popularity. Many bloggers and web writers have shifted to using Markdown, though a few still use word processors or WYSIWYG editors. "The overriding design goal for Markdown’s formatting syntax is to make it as readable as possible. The idea is that a Markdown-formatted document should be publishable as-is, as plain text, without looking like it’s been marked up with tags or formatting instructions." This is the reason that Markdown has become popular for web writers who publish their content on to the web or other digital channels. Markdown text can be converted to HTML or many other formats (e.g. PDF, Word, etc.) using tools such as Pandoc. There are also online editors for Markdown such as http://dillinger.io/, that shows you the formatted HTML side-by-side. Blogging platforms such as Wordpress have also started supporting Markdown syntax. Even the Ghost blogging platform supports Markup. But there are limitations on what you can do in Markdown when it comes to complex formatting. Hence the format allows you to embed HTML code inline whenever you want some complex formatting. "Markdown is not a replacement for HTML, or even close to it...The idea for Markdown is to make it easy to read, write, and edit prose." Pandoc can also be used for reverse translation - i.e. to convert HTML, Word docx files to Markdown format. Recently I coauthored a whitepaper on APIs and the important role they play in the digital economy. Setup (installation and configuration) of servers and other infrastructure components is a tedious process. In the olden days, process-oriented teams created meticulous documentation on 'how to setup a server' - typically in a word document with screenshots and step-by-step instructions. Folks then tried to automate some tasks using scripts - e.g. unix shell scripts/bash etc. But today, in a cloud-first world, setup of servers and deployment of applications need to be completely automated. The whole premise of 'Infrastructure-as-Code' is to write code in a high level language (e.g. Java, Python, Ruby) or a DSL (domain specific language) to automate the provisioning of infrastructure and managing configurations. So this goes beyond just writing simple scripts. You utilize all the best practices of agile development projects - i.e. version control, unit testing, iterative development, etc. The whole revolution happening in DevOps acted as a catalyst in promoting the concept of 'programmable infrastructure'. In DevOps, the core concept of 'You built it, You run it' promotes closer collaboration between the development teams and IT ops team. Popular tools such as Ansible, Kubernetes, Puppet, Chef, etc. can be used to automate your complete deployment cycle and help you achieve Continuous Delivery. Laptops suffer from so many idiosyncratic battery problems and have their own ritual of try-n-test solutions that appear so weird ! Recently, I was facing a unique problem on my HP pro book 440. The charger was connected, but the battery was not charging. The status showed - "Plugged in, not charging". I tried multiple options to rectify this - by removing and plugging in the battery, by restarting the machine, but nothing worked. The following steps posted on HP forum finally did the trick. While a lot of attention has been given to online experiences in digital transformation, there are a lot of opportunities in enhancing the in-store experience in brick-n-mortar stores. 84% of customers use their mobile phone in stores to help them shop. Customers spend an average of 15 mins using their smartphones inside stores. Customers use their smartphones for searching for products/services - 82% use a Search Engine, 62% use Store website, 50% use Brand website. Thus mobile has the power to transform the shopping experience in stores. Also beacons can be utilized to provide location context sensitive promotions to customers. SweetIQ has put up a neat infographic that illustrates how beacons can be used to enhance the in-store digital experience. Today we have a robust set of tools for code versioning, CI and release management - for e.g. Java, .NET, Ruby web or REST applications. Examples of tools are Github, Hudson, Jetkins, etc. But what about the RDBMS? How do we manage it across the various environments - i.e. from development to integration to UAT to production. A good illustration of the typical challenges is given here. Flyway is a tool to address these problems. Using simple techniques such as a schema-version table and automatically apply db scripts (that follow a naming convention for sequence tracking), the tool can help any Agile project in managing RDBMS instances across different environments. It would also be a nifty addition to your existing DevOps tools. In a microservices architecture, one has to build services that can handle failures. For e.g. If a microservice calls another dependent microservice that is down, then we need to handle this using timeouts and implement the Circuit Breaker pattern. If the remote service call does not return within a specified threshold, Hystrix times-out the call. Hystrix enables developers to implement a fall-back action when a request fails, for e,g returning a default value or a null value or from cache. It was also interesting to learn that the tech guys at Flipkart have taken Hystrix and implemented a service proxy on top of it called 'Phantom'. Looks like the advantage of using Phantom is that your consumers do not have to code against the Hystrix libraries. A friend of mine introduced me to the a suite of powerful tools used at Netflix for testing the resilience and availability of their services. The suite of tools is called 'Simian Army', which essentially is a collection of tools such as 'Chaos Monkey', 'Latency Monkey', 'Security Monkey', etc. Another interesting blog on the lessons that Netflix learned after migrating to AWS is available here. Using story points for estimating user-stories in helpful because it encourages us to use 'relative sizing' and estimating the 'size of work' and not the real effort required. Mike Cohn has given a good analogy by relating this concept to running a trail. Two people can agree on the fact that the trail is 5 miles long, but one may take 30 mins and the other may take 45 mins. During the Planning Poker game, each developer is given cards with numbers 1,2,3,5,8 on them. Then the Scrum Master and Product Owner take the effort sizing from all developers to arrive at a consensus. The Fibonacci scale is quite popular for estimating the user-story or epic size, as there is sufficient difference between the numbers to prevent confusion. For e.g. If the scale is sequential, then there would be a debate around sizing of 6 or 7 or 8. But a Fibonacci scale, makes it easy to relative sizing. If your team is adopting SCRUM for the first time, then it is better to have a full-time Scrum Master. He would be responsible for ensuring that all agile processes are followed and everyone understands the rules of the game. The Scrum Master essentially acts as an evangelist educating teams on all aspects on SCRUM. Once the teams have become comfortable with SCRUM processes, then we can have a part-time Scrum Master. IMHO, the technical architect or tech lead is most suited to play this role. One of the main functions of a Scrum Master is to remove all impediments that the team faces. To be successful in this role, you need someone who can understand the technical complexities, business drivers and has a good rapport with the product owner. Hence architects are a good fit for the role of a Scrum Master. The Scrum Master also facilitates the daily Scrum and weekly Scrum of Scrums to facilitate collaboration across teams. He also leads the retrospectives and facilitates combined learning. We all know the importance of Retrospective meetings after a Sprint. This is an excellent time to reflect on what worked, what did not work and what areas need improvement. what should we continue doing (with some changes if required). Then after collecting everyone's views, the team should brainstorm and debate around all the ideas presented and select the top 3 or 5 ideas that they would implement in the next sprint. Many teams start skipping the retrospective if their project is running smoothly, but it is important to remember that there is always scope for improvement, no matter how good your team is currently functioning. We used to use browser tools such as Firebug to find out more 'backend' information about a particular site - for e.g. what servers does it run on? What server-side web technology is being used? What web content management tool is being used? etc. A useful tool to have in the arsenal for any web-master. One of the fundamental tenets that any analytics newbie needs to learn is that - Correlation does not imply Causation ! Using statistical techniques, we might find a relationship between two events, but that does not mean that the occurrence of an event causes the other event. Jotting down a few amusing examples that I found from the internet. Sleeping with one's shoes on is strongly correlated with waking up with a headache. Therefore, sleeping with one's shoes on causes headache. As ice cream sales increase, the rate of drowning deaths increases sharply. Therefore, ice cream consumption causes drowning. The more firemen are sent to a fire, the more damage is done. In the early elementary school years, astrological sign is correlated with IQ, but this correlation weakens with age and disappears by adulthood. My dog is more likely to have an accident in the house if it’s very cold out. Today we learned about a nifty tool in Excel that can be used to solve 'maximizer' or 'most optimal' solution to problems. For e.g. Given a set of constraints, should we make cars or trucks. The below links would give a quick idea on how to use this tool to find out optimal solutions and also carry out 'what-if' analysis. You enter the objective, constraint and decision variable cells and let the tool do the magic. Import.io essentially parses the data on any website and structures it into a table of rows/columns - "Turn web pages into data". This data can be exported as an CSV file and it also provides a REST API to extract the data. This kind of higher abstraction over raw web crawling can be extremely useful for developers. We can use the magic tool for automatic extraction or use their free tool to teach it how to extract data. Recently we were looking for a mass email software for a marketing use-case. Jotting down the various online tools/platforms that we are currently evaluating. In the UX world, you would often come across the phrases such as "compliance with Section 508". So what exactly is Section 508 and how does it relate to User Experience? "Section 508" is actually an amendment to the Workforce Rehabilitation Act of 1973 and was signed into a law in 1998. This law mandates that all IT assets developed by or purchased by the Federal Agencies be accessible by people with disabilities. The law has stated web guidelines that should be followed while designing and developing websites. It is important to note that Section 508 does not directly apply to private sector web sites or to public sites which are not U.S. Federal agency sites. But there are other forces at play, that may force a organization to make their websites accessible. The ADA (Americans with Disabilities Act) that was passed way back in 1990 prohibits any organization to discriminate on the basis of disability. Beyond the legal regulations, there are also open initiatives aimed at improving the accessibility of websites. W3C has an initiative named "Web Accessibility Initiative (WAI)" that lays down standards and guidelines for accessibility. There is also a standard for content authoring called - "Web Content Accessibility Guidelines (WCAG)". Jotting down the high level guidelines that should be followed for accessibility. Equivalent alternatives for any multimedia presentation shall be synchronized with the presentation. For e.g. synchronized captions. Web pages shall be designed so that all information conveyed with color is also available without color, for example from context or markup. Color is not used solely to convey important information. Ensure that foreground and background color combinations provide sufficient contrast when viewed by someone having color deficits or when viewed on a black and white screen. Documents shall be organized so they are readable without requiring an associated style sheet. If style-sheets are turned off, the document should still be readable. Data tables have column and/or row headers appropriately identified (using the element). Pages shall be designed to avoid causing the screen to flicker with a frequency greater than 2 Hz and lower than 55 Hz. No element on the page flashes at a rate of 2 to 55 cycles per second, thus reducing the risk of optically-induced seizures. My team was working on implementing CEP (Complex Event Processing) capabilities using Apache Storm. We evaluated multiple options for doing so - one option was using a lightweight in-process CEP engine like Esper within a Storm Bolt. But there was another option of manually implementing CEP-like aggregations (over a sliding window) using Java code. The following links show us how to do so. While the above code would help in satisfying certain scenarios, it would not provide the flexibility of a CEP engine. We need to understand that CEP engines like (Tibco BE, Esper, StreamInsights) are fundamentally different from Apache Storm; which is more of a highly distributed stream computing platform. A CEP engine would provide you with SQL like declarative queries and OOTB high level operators like time window, temporal patterns, etc. This brings down the complexity of writing temporal queries and aggregates. CEP engines can also detect patterns in events. But most CEP engines do not support a distributed architecture. Virtualization has been the underpinning technology that powered the Cloud revolution. In a typical virtualized environment, you have the hypervisor (virtualization software) running on the Host OS. These type of hypervisors are called "Type 2 hypervisor". But there are hypervisors that can be directly installed on hardware (i.e. hard disk). 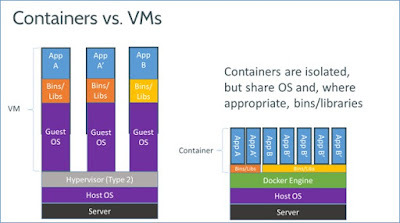 These hypervisors, know as "Type 1 hypervisors" do not need a host OS to run and have their own device drivers and other software to interact with the hardware components directly. A major advantage of this is that any problems in one virtual machine do not affect the other guest operating systems running on the hypervisor. The below image from Wikipedia gives a good illustration.